5.0lt, bravo I, 2001 Sea Ray Weedkender 24ft in EXCELLENT condition! It also features a stereo system w/cd player, controlled by either the unit itself or by the dashboard controls. Boat is 24' length total including the swim platform. Boat includes a bimini top with full camper enclosure, boat cover, swim platform with 3 step fold down ladder. 6 gallon fresh water wash down with transom. Boat has hydraulic trim tabs, hydraulic trim on outdrive. 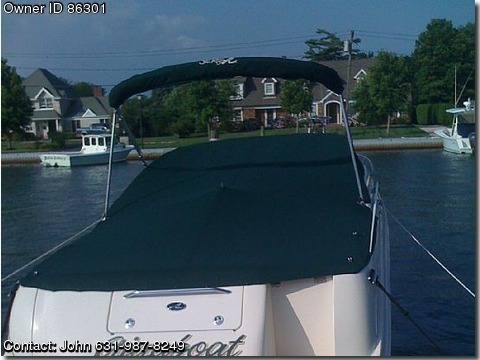 Boat also has snap in/snap out carpeting, sleeps two people comfortably, sink, toilet with pump out from the deck. The boat is a great multi-purpose family boat. This boat has been meticulously maintained by a professional and dry docked, shrunk wrapped every winter.